Last Friday, I turned in my latest draft of Book 2. It’s been sent to copyediting! I promise I’ll tell you something more substantive about Book 2 one of these days. In revising the manuscript, I was occasionally distracted by particular sentences that caught my attention for linguistic reasons. There was little reason for me to dwell on these sentences from a writing perspective, but my linguist’s brain would latch onto them and wonder. Now you get to see what sorts of things I get hung up on (and you can offer your judgments and/or ridiculous sentences too!). Their gazes never lingered on each other. Somewhere between Drafts 2 and 4, it struck me that this sentence was ungrammatical. It violates Condition A of Binding Theory, which says that anaphors must be locally bound. What does that mean? Anaphors include reflexives (like himself) and reciprocals (like each other). For an anaphor to be locally bound, it must have an antecedent (the thing it is co-indexed with, or refers back to) that is sufficiently close to it, where sufficient closeness is defined in technical linguistic terms. To give a quick example, Will likes himself is good, but *Will thinks Lyra likes himself, where himself is meant to refer to Will, is bad because Will is somehow too far away to serve as the antecedent of himself. A’s gaze never lingered on B, and B’s gaze never lingered on A. That is, the things the gazes are not lingering on are people, not gazes. In other words, the anaphor each other refers back to they (the people), not their gazes. The intended antecedent of each other is they. For this to be grammatical, then, they must locally bind each other (in order to satisfy Condition A). But it can’t. To show why, I’m going to pretend I haven’t forgotten most of my syntax and draw a tree. A’s gaze never lingered on B’s gaze, and B’s gaze never lingered on A’s gaze. And maybe this is fine. Gazes can linger on other gazes as well as on people, right? Why not? Their dogs never bit each other. This sentence must mean A’s dog never bit B’s dog, and B’s dog never bit A’s dog. It cannot mean A’s dog never bit B, and B’s dog never bit A. It can’t be about two well-behaved dogs who never bit each other’s humans. Do you agree? 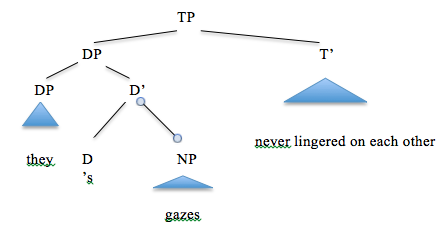 Similarly, in Their gazes never lingered on each other, each other cannot refer to two people, it can only refer to the gazes. Okay, so that’s what the principles of grammar say, but really, is it that hard to get my intended reading? I don’t think it is, which is why it took me so long to notice this sentence was probably ungrammatical. Gazes, unlike dogs, are not sentient, so we accept that each other refers back to people rather than to gazes. Semantics are powerful enough to get around what the syntax is telling us. I’m curious to see whether the copy editor flags this sentence. “These remind me of our cook’s cinnamon buns,” says Hilah. “Are hers as good as ours?” I tease. I later changed the second line of dialogue to avoid the problem I’m about to get into. Here’s why this sentence gave me pause: I meant ours to mean our cook’s cinnamon buns (the ones the girls are eating in this scene), but one day I realized it only meant our cinnamon buns. Rivka (“I”) is comparing the two cooks’ cinnamon buns, but the sentence doesn’t quite mean that. The issue is that our cook’s cinnamon buns has two possessive morphemes in it (compare Rivka‘s cook‘s cinnamon buns). This is obscured because in English we + ‘s = our. For ours in the dialogue above to mean our cook’s cinnamon buns, it also needs to have two possessive morphemes and look something like ours’s. That got me wondering whether English allows the stacking of ‘s. I’m still not sure what the answer is. I think it is worse to stack them when they both have to be pronounced as ‘s, as in Eleanor’s’s. However, when ‘s combines with pronouns, it goes away, making stacked possessive morphemes sound better, as in mine’s. Your laptop is older than mine, but mine’s battery doesn’t last as long. Speaking of political views, a certain friend of mine’s are off the wall. Speaking of books, a friend of mine’s’s pages are falling out. Speaking of books whose pages are higher quality, a friend of mine’s’s’s quality is amazing. With trembling hands, I open the drawer at my waist and find myself in the right part of the alphabet. But when I find the place where Kadmiel should be, there is nothing. He moves his hand in a series of shapes while Caleb looks on, amused but also pleased. The string of signs seems too long, though. “Is that Elisha?” I say. So, here’s the thing: both these scenes involve the alphabet. But what alphabet? In the world of the novel, nobody is speaking English. Their spoken (as opposed to signed) language is Ashari. So when Rivka finds herself in the right part of the alphabet to find Kadmiel, where is that? It shouldn’t be the English alphabet, but in fact the way I wrote the scene sort of assumes this. I envision the drawer at Rivka’s waist to be a middle drawer of a file cabinet, and K is roughly in the middle of the English alphabet. Should it have been the Hebrew alphabet1? Kadmiel begins with ק qof, which is toward the end of the alphabet, so in that case Rivka ought to have been opening a drawer at her feet. But in fact, the Ashari alphabet can have whatever order I want it to. I just haven’t invented it. In the second scene, the characters are fingerspelling. But as I wrote the parts about a name looking too long and two names sharing certain signs/letters, I started to wonder about alphabets again. What does this fingerspelling alphabet look like? Does it have signs for consonants and vowels, like American Sign Language, or does it omit signs for (at least some) vowels, the way I believe both Hebrew and Israeli Sign Language do? I managed to write this scene while remaining agnostic on this question, but I did make sure that the statements the characters make meshed with a fingerspelling system based more on Hebrew than on English.